Except in the improbable event that he comes back to win the Republican nomination, Marco Rubio is likely to become a political idiom. As Mike Huckabee is synonymous with a candidate who wins Iowa on the basis of evangelical support but can’t expand beyond that, or Fred Thompson is a stand-in for a candidate who launches his campaign too late, a “Rubioesque” candidate will be one who is everyone’s second choice. For a long time, polls have shown Rubio as perhaps the most broadly acceptable candidate within the Republican field, with high favorability ratings1 and competitive performances in hypothetical one-on-one matchups against Donald Trump. But Rubio has just about 20 percent of the Republican vote so far and has won only Minnesota and Puerto Rico. Hawaii results are still pending as I write this, but he did terribly everywhere else on Tuesday and will probably fail to receive any delegates from Michigan, Mississippi or Idaho. Data like this can produce cognitive dissonance. At times during the campaign, Rubio perpetually seemed to be either overrated or underrated, depending on who was doing the rating. But there’s nothing inherently contradictory about it. If Trump is the candidate with a high floor of support but perhaps a relatively low ceiling, Rubio is the opposite, with a lot of potential supporters but a low floor — he doesn’t have much of a base. Problem No. 1: Rubio hasn’t built up a lot of voter loyalty. It’s not my job to judge the candidates’ credentials, but I sympathize with Republicans who think Rubio’s are a little light. As a first-term senator at a time of political gridlock, he hasn’t gotten much legislation passed: According to the Thomas database, the only bill to have become law of which Rubio was the main sponsor is the Girls Count Act of 2015. His most high-profile legislative effort, on immigration reform, ended in failure. Rubio did have some accomplishments as speaker of the Florida House of Representatives, although he hasn’t talked about them much on the campaign trail. Perhaps that’s because Rubio is wary of drawing comparisons to Barack Obama, who, likewise, was a first-term U.S. senator and a former state legislator when he sought the presidency. But Rubio didn’t replicate Obama’s success in one important way. Whereas Obama built a gigantic ground operation from the earliest stages of his campaign, Rubio failed to develop much of one. That contributes toward a low floor. If you’re not contacting voters personally, they aren’t all that invested in you, and although they may come your way from time to time, they also may abandon you at the first sign of trouble. Also unlike Obama, Rubio didn’t receive all that much media exposure. Instead, like every other Republican candidate, he was overshadowed by Trump, who got nine times as much coverage on network news as Rubio did in 2015. Without that vetting having taken place earlier in the campaign, Republicans are learning a lot about Rubio as they’re already in the midst of voting, contributing to the volatility in his political standing. Problem No. 2: Trying to be everything to everyone isn’t easy. 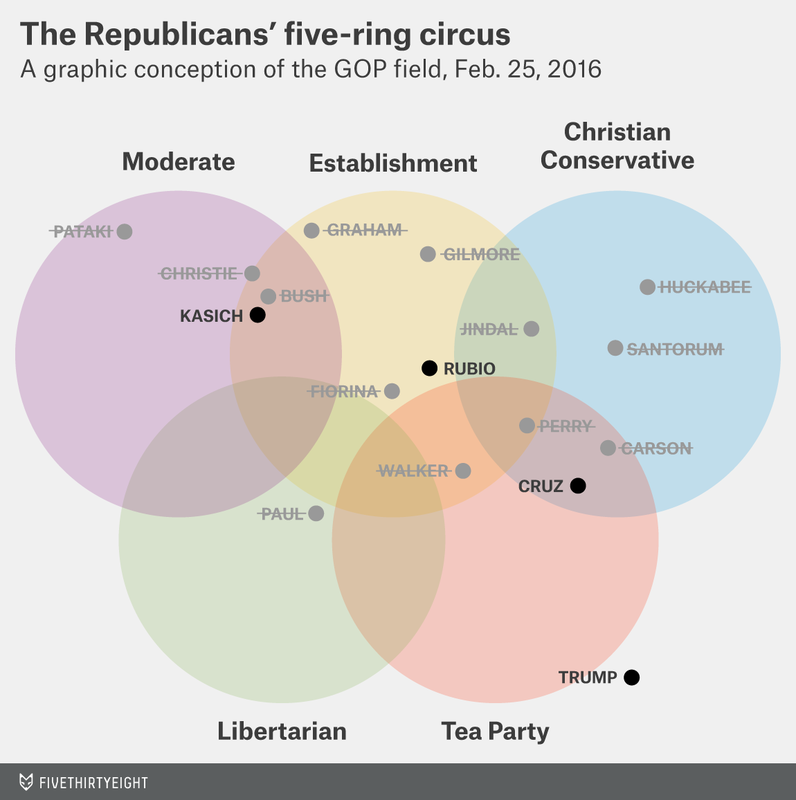 You may remember our old friend the Republican “five-ring circus” diagram, which depicts the overlapping constituencies that the Republican candidates seek to win votes from. From the start, we’ve put Rubio in the “establishment” circle, thinking he’s too far removed from his days as a tea-party-backed candidate to still qualify as one. The establishment circle is a special place, however. It’s not that there are literally all that many establishment voters (except, maybe, in the northern Virginia suburbs, where Rubio performed well). Instead, the more successful establishment candidates seek to be consensus candidates, keeping the peace with some or all party factions. Consider Mitt Romney, who was elected governor in Massachusetts as a pragmatic moderate, then ran as a movement conservative in the Republican race of 2008 and then was somewhere in between those things when he was nominated in 2012. Or Obama, who in 2008 ran as a “post-partisan” candidate to some Democratic voters and as a progressive hero to others. Such candidates can be accused of shape-shifting or flip-flopping, but they often capture their party’s nomination. Such a strategy requires a lot of political dexterity, however. Not only do you have to stay “on message,” you have to sustain multiple messages to multiple audiences. (Trump, although hardly a consensus candidate, has some of this ability.) It helps to have surrogates vouching for you to different constituencies, something Rubio didn’t have a lot of until recently. And it helps to have enough media exposure to avoid being typecast in one role, something Rubio hasn’t had all that much of in Trump’s shadow. Problem No. 3: Rubio’s cosmopolitan image is an odd match for his conservative politics. 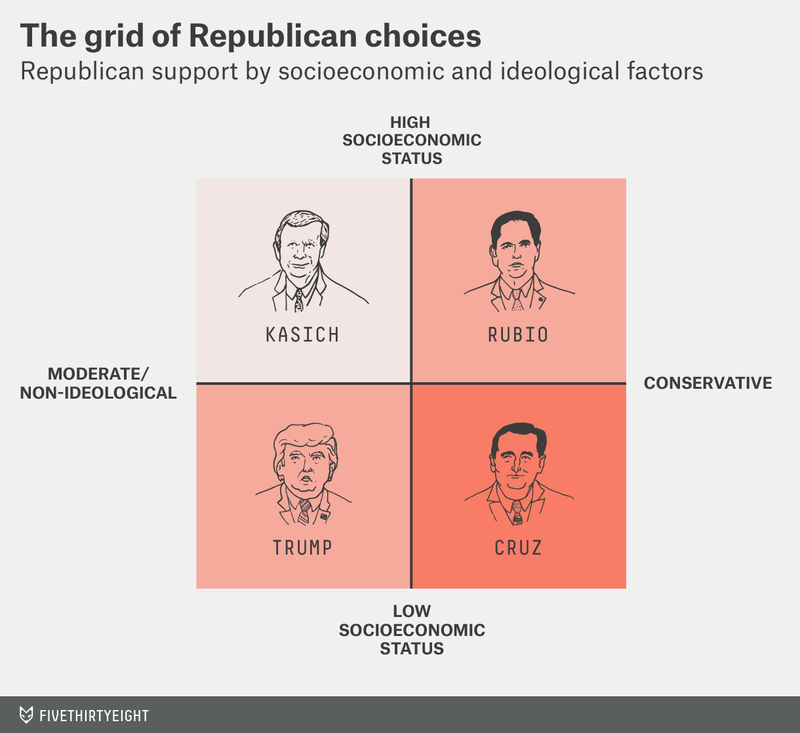 The Republican race is tricky to map demographically, especially in comparison to the Democratic one. Trump’s best congressional districts so far, according to data that my colleague Aaron Bycoffe and I have collected, include such diverse places as NV-1 (Las Vegas), AL-4 (rural northwest Alabama) and MA-9 (far eastern Massachusetts, including Cape Cod). TX-33: A highly Democratic district covering parts of Dallas and its suburbs. MN-5: A highly Democratic district covering parts of Minneapolis and its suburbs. GA-5: An extremely Democratic district covering parts of Atlanta and its suburbs. MN-4: A highly Democratic district covering parts of St. Paul, Minnesota, and its suburbs. VA-8: A highly Democratic district in northern Virginia, covering the Washington suburbs. Now, if Rubio were a moderate or liberal Republican (or a conservative running in moderate garb, like John Kasich), this is pretty much what you’d expect to see. But he isn’t: Rubio’s voting record and issue positions are quite conservative, and he’s run as a conservative. Furthermore, although this has varied some from state to state, exit polls haven’t shown Rubio doing especially well with moderate voters; in South Carolina, for example, he won 23 percent of the vote from moderate Republicans, about the same as his share of the vote overall. It may be that Rubio’s most reliable voters are conservatives who live among liberals, a difficult group to build a base from. That chart is a simplification, of course, most notably because it implies that the four quadrants are equally sized when they probably aren’t. Trump, in particular, is proving that there’s a fairly large market for populism among Republicans and independents who vote in Republican primaries, especially those with lower socioeconomic status. Trump’s voters average out to being fairly moderate, although they aren’t conventionally so: From what we can tell, for instance, his voters don’t care very much about abortion or gay marriage, although they do care about immigration. Rubio, by contrast, may be proving that there’s not all that large a market for what you might call an upscale or cosmopolitan conservative. Many voters in the near-in suburbs, Rubio’s best areas geographically, long ago left the Republican Party. Rubio might have the image to win them back — young, Hispanic, optimistic — but he doesn’t have the policies, being staunchly conservative on issues such as abortion and gay marriage. Likewise, while Rubio appears to do well among nonwhite Republicans, there are very few of them voting in the primaries, and Rubio has turned away from the moderate immigration positions that once might have won him more Latino support. Rubio is also somewhat boxed in by Cruz and, to a perhaps underappreciated extent, Kasich. If Cruz weren’t in the race, there would be a scramble between Rubio and Trump for voters in the bottom-right corner of the chart, who have lower socioeconomic status but are highly conservative (and often very religious). Rubio might win it: He could position himself as the only true conservative in the race, and polls suggest that more Cruz supporters have Rubio as their second choice than Trump. If Kasich were out of the race, meanwhile, Rubio could pivot more toward the center — at an opportune time, given that the calendar is turning to blue and purple states. But with Cruz and Kasich still running — and in fact, seeming to gain ground in recent days — Rubio is back to where he started, as a lot of voters’ second choice. Although they have slipped recently in some polls.